President Trump delivered a speech during the World Economic Forum annual meeting in Davos, Switzerland, last year. WASHINGTON — President Trump on Thursday canceled his planned trip to the annual and glittering economic conference in Davos, Switzerland, later this month, citing what he called the Democrats’ intransigence on his funding request to build a wall along the United States’ southern border. Trump and congressional Democrats are at an impasse over the president’s request of more than $5.7 billion to build the wall. That impasse caused a partial government shutdown, which has been going for nearly three weeks. The forum, an annual gathering of the world’s political and financial elite, is typically an event American presidents avoid. Trump was the first president to attend the forum, in 2018, since Bill Clinton attended in 2000. 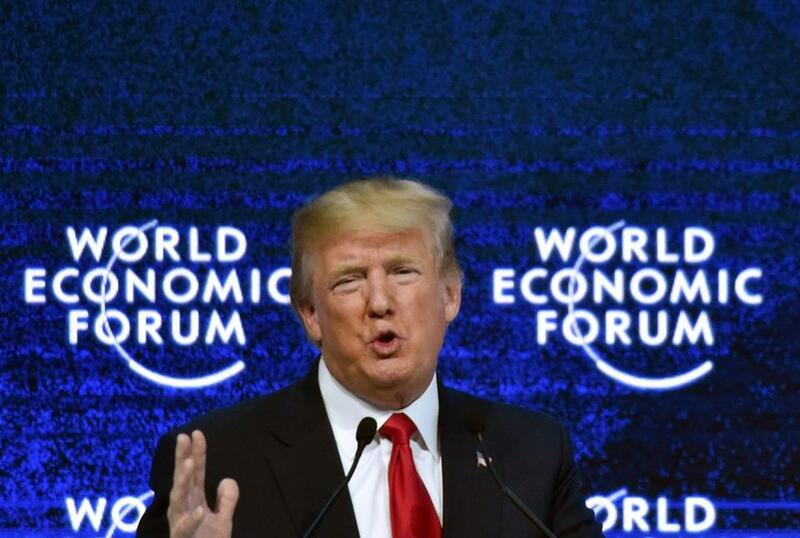 Earlier Thursday, officials in Davos authorized a protest by a socialist youth group against Trump and other expected attendees of the Davos conference. WASHINGTON — President Trump said Thursday that he knew nothing about his former campaign chairman, Paul Manafort, allegedly sharing 2016 presidential campaign polling data with Konstantin Kilimnik, an associate the FBI has said has ties to Russian intelligence. That information was included in a court filing this week that appeared to inadvertently include details not intended to be made public and indicates a pathway by which the Russians could have had access to Trump campaign data. ‘‘No I didn’t know anything about it,’’ Trump said in response to a question from a reporter as he departed the White House en route to Texas, where he is visiting the US-Mexico border. Trump did not elaborate and turned to another reporter with a question on a different topic. Trump’s response comes as Special Counsel Robert Mueller continues to probe whether there was coordination between Russia and the Trump campaign. Manafort on Tuesday denied in a filing from his defense team that he broke his plea deal by lying repeatedly to prosecutors working for Mueller about that and other issues. The special counsel alleged Manafort ‘‘lied about sharing polling data with Mr. Kilimnik related to the 2016 presidential campaign,’’ according to the unredacted filing. The source of that data, including whether it came from the Trump campaign, is unclear. President Trump’s decision to abruptly storm out of a meeting with congressional leaders on Wednesday shocked some on Capitol Hill. But those who have done business with him recognized it as one of his trademark negotiating tactics. His dramatic exit on Wednesday, however, appeared to gain him little traction with House Speaker Nancy Pelosi and other Democratic lawmakers who attended the Situation Room meeting. She called Trump’s approach to the shutdown talks “pathetic,” and Senate minority leader Chuck Schumer said the president had thrown a “temper tantrum,” slamming the table before walking out.